View cart “Fruits and Nuts” has been added to your cart. Creeks are a favorite nature study stop for many families. This NaturExplorers guide gives you enough ideas to keep you joyfully studying creeks for months! Creeks are a favorite nature study topic for so many people. Their amazing beauty and unique essence keep us coming back for more. Whether you’re in the mood for active and exciting study or peaceful pondering, the creek is the perfect place to suit any style. A vast amount of living and non-living treasures await as you follow the meandering paths carved out by the star of the show, flowing water. Learn just what amazing power this water holds as you explore Incredible Creeks. The outdoor study section in this guide is huge – with more than 50 nature walks! Discover the power of water. Determine the health of a creek. Learn about the protection of the riparian zone. Discover an abundance of plants and critters living near the creek. Get wet or stay dry. You get to choose how to complete the activities! Back at home, choose from a bunch of meaningful experiments and hands-on lessons. Complete super-fun research projects on any topic that strikes your fancy ranging from animal classification and wetlands to river towns and dams. There are more than 25 creative ideas! Incredible Creeks includes 13 notebooking pages. On your busiest days, pull out a notebooking page and go! Scavenger hunts, comparison charts, graphing exercises, recording sheets and more can be added directly to your nature journal or science notebook upon completion and they’re cute to boot. This is our biggest NaturExplorers guide to date and it’s just full of goodness. (Shhh…it’s one of my very favorites!) If you have access to any creek – big or small – this curriculum is not to be missed! Any season is a great time for studying and enjoying creeks! 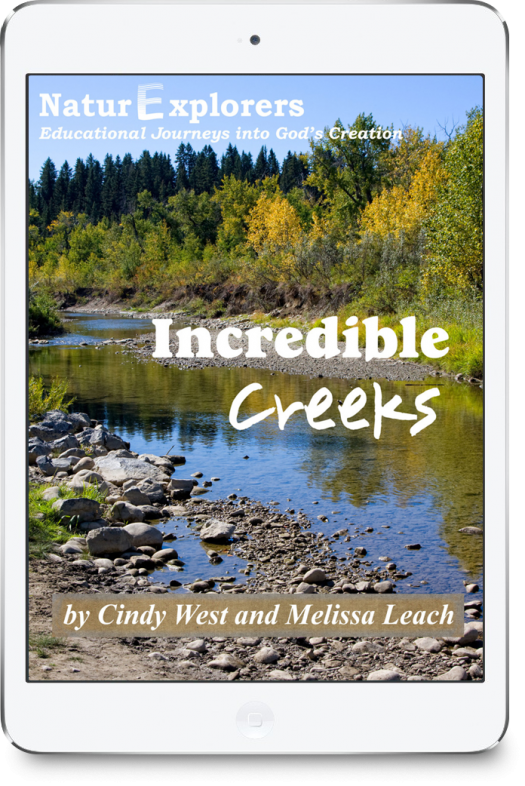 Incredible Creeks goes well with any general earth science study, including weather, water, rocks, and erosion. It can also compliment general plant and animal studies. What will I find in each NaturExplorers guide? For what grade levels are the NaturExplorers guides appropriate? The NaturExplorers series was written with 1st-8th graders in mind. All of the activities in the curriculum are very adaptable for all ages, though, and specific ideas are included for incorporating your older and younger students. We have personally used NaturExplorers with children from three to fifteen, with all ages (even adults) drawn in almost magically. Are NaturExplorers guides appropriate for group situations like co-ops, clubs or traditional classrooms? Yes! Most of the ideas can easily be used with groups of children -traditional classrooms, homeschool co-ops, summer camps, after school programs, 4-H programs, and more. Additionally, there is a small section of ideas written specifically with groups in mind. Are NaturExplorers guides only appropriate for those using a certain homeschooling method? 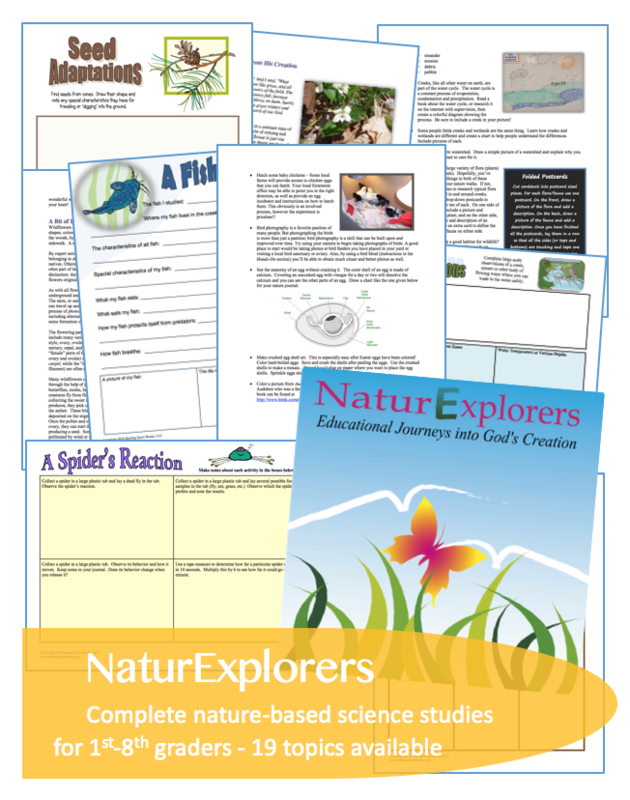 Any homeschooler using any homeschooling style will find NaturExplorers guides useful. 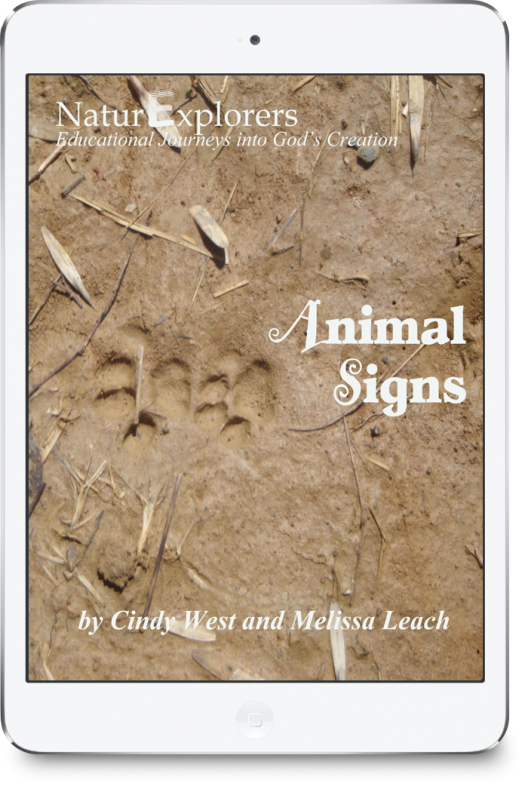 Charlotte Mason homeschoolers will love the ideas for tying in poetry and artist and composer studies, as well as the living literature lists to enhance learning. Those who use unit studies will be excited that most of what they need for a full unit study is already here. Unschoolers will appreciate the ability to find easy to implement ideas at just the right time. Project-Based homeschoolers will be excited at the large amount of project ideas that meet many learning styles. Traditional and Classical homeschoolers will be able to pull as little or as much from the ideas as they desire. 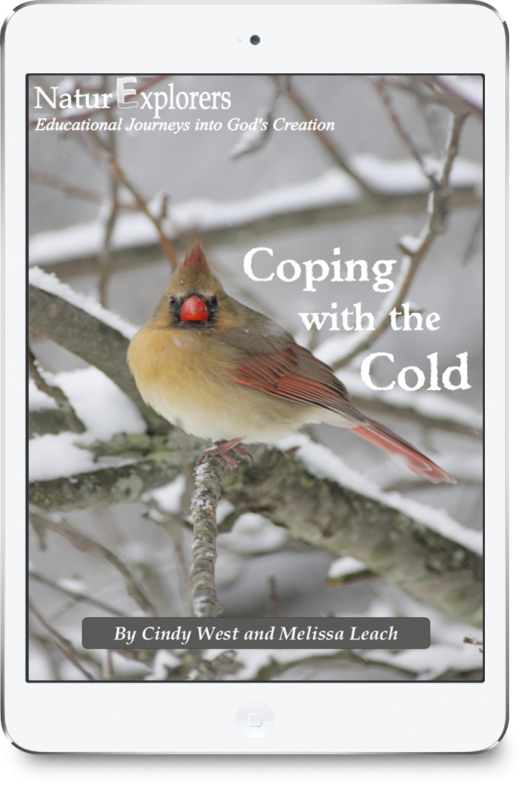 New homeschoolers and teachers will appreciate the thoroughly laid out ideas, while veteran homeschoolers and teachers will be thankful that the ideas are already pulled together and ready to use. How long does each NaturExplorers study last? It depends entirely on how you decide to use the curriculum. Since the guides are extremely flexible, you might choose to spend a week, two weeks, a month, or more immersing your family in the study of one topic – much like a unit study. If you simply need nature walk ideas, you might spend one month or one year on a single topic. Either way, you’ll have plenty of ideas to keep you busy! The beauty of each study is its adaptability. You can simply pick one nature walk and put the book down, or you can take nature walks again and again focusing on the same nature topic and not run out of new ideas for a very long time. If desired, the nature topic can be used as a full-fledged, science-based unit study. Besides math and phonics, you will find ideas for virtually every other subject. Some of the guides even include a hands-on math idea or two! What if I can’t find the books you recommend at the library? No need to worry! The NaturExplorers curriculum is not at all dependent on the literature suggestions. You are free to find other books on the same topic, or leave extra reading out completely. Which NaturExplorers studies are appropriate for the various seasons? This answer varies depending on the part of the world in which you live. A sample list provided below is most appropriate for those who enjoy each of the four seasons in their fullness. Keep an eye open in your area and you’ll soon see which topics are most appropriate during a particular season. Are NaturExplorers only for those living in the United States? No way! While each NaturExplorers guide focuses on a particular topic, the lessons are not dependent on any particular things within that topic. 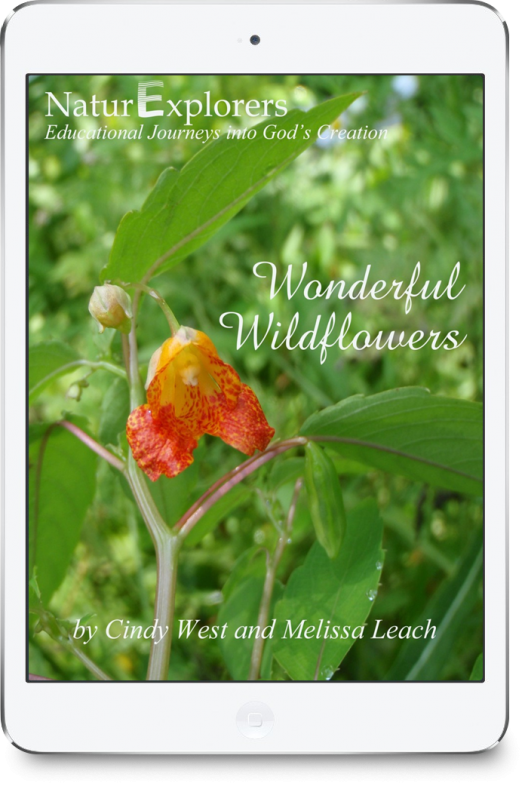 For instance, if you have access to any flower anywhere in the world, you will be able to use the Wonderful Wildflower guide. 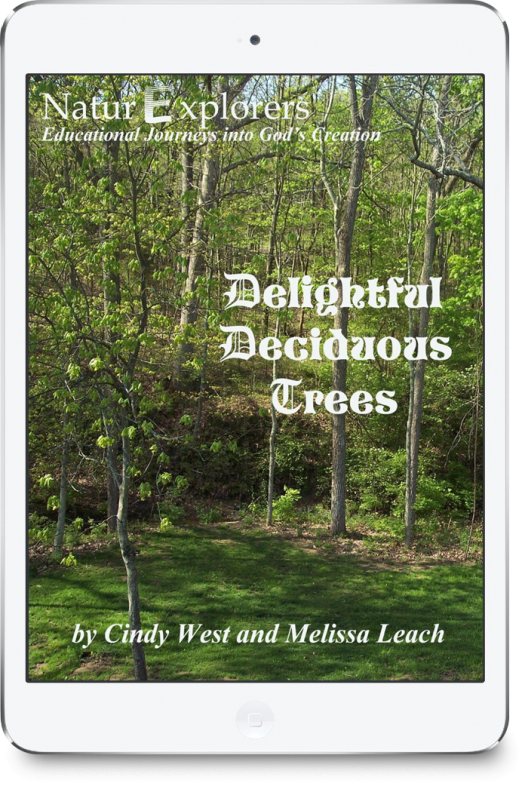 Or, if you have access to any deciduous tree, you will be able to use the Delightful Deciduous Trees guide.